. :Save Our Strays Dog North East Rescue Charity- Why a rescue dog:. and I've cuts on my feet. and left me to roam. so where are they now ? and show that I care. and teach me to live. on the streets all alone. was it all in my head? there was no going away. to be loved by you. Thank you to all those who have rescued a dog. What a rescue dog can do. Lucy came into our care as a frightened little girl who was scared of her own shadow! Very undernourished and not cared for, but always with a gentle and friendly nature. 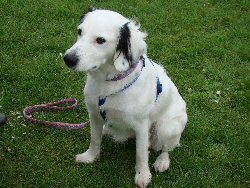 Adopted by Christine and Bill and their lovely collie Bob she soon flourished and settled well in her new home. The family travel all over the country to attend Fly Ball competitions which Lucy loves. We would like you to see Lucy now and in the short video how much she enjoys the running for the ball. Cross breed dogs make excellent pets. They often don't have many of the genetic disorders or inherited health problems of many of the pure pedigrees. This is because by having a number of different breeds in their background, they reduce the risk of inheriting the breed specific problems. For example, cross breeds are less likely to suffer from problems that pure pedigrees display, as they often combine the different traits of a number of breeds and this can be a very good combination. For example, collie crosses are often a little less obsessive or energetic as their pure breed counter parts (although collies are wonderful dogs, this is just an example) So please consider the Heinz 57 variety dog next time you are re-homing. People don't seem to be aware of how long many black dogs have to wait for a home when they are brought to rescue centres. This is because people pass them up for lighter coloured dogs. Why beautiful black dogs are overlooked is a mystery. Their nature is no different to other dogs - the only difference is their colour. Yet rescue centres report, internationally, that black dogs wait much longer for a home than other colours. There are a number of theories - too common, superstitions about the colour etc. However, If you are thinking about adopting a dog please don't overlook black dogs because they are just as loving and wonderful as any other. There are lots of myths about rescue dogs, hopefully we can dispel a few of those myths. On this page some of the issues mentioned above are very real concerns for rescue centres and prove a challenge when finding new homes for their dogs. So, please consider these issues when you next re-home a dog. While puppies are wonderful they are also a lot of work and need training and socialising thoroughly to be happy healthy dogs. However, there are many adult dogs in rescues who need homes. Many families buy a puppy from a breeder because they know it's history or because they think they can train it to be one of their family. There are many young dogs from 6 months and older in rescue who may be a better choice for a family than an 8 week old puppy. This is because they will usually be house-trained, have gone through the chewing the furniture stage, should be socialised well from the meet and greets and foster families and if you get a dog who is two or over they will be a little calmer and can be left for reasonable periods while you are at work, unlike a puppy. There is also the added bonus that you are helping re-home dogs that need homes desperately or often are facing being destroyed rather than encouraging puppy mill style breeders. Please consider a rescue dog or rescue puppy if you are thinking of re-homing.